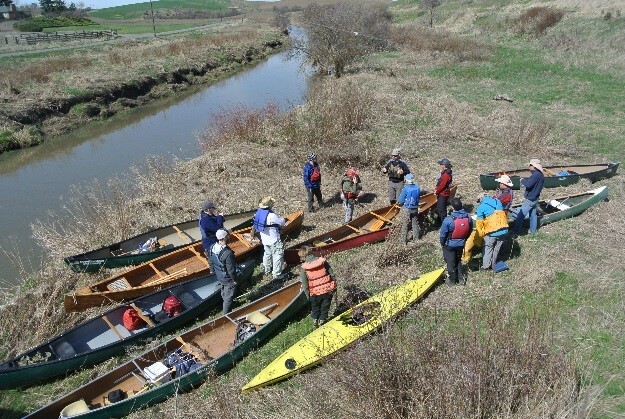 In celebration of Earth Day, your Riverkeepers gathered with a dozen friends for a canoe trip down a section of upper Hangman Creek. We were blessed by warm spring weather, and we had folks of all sorts and ages along. 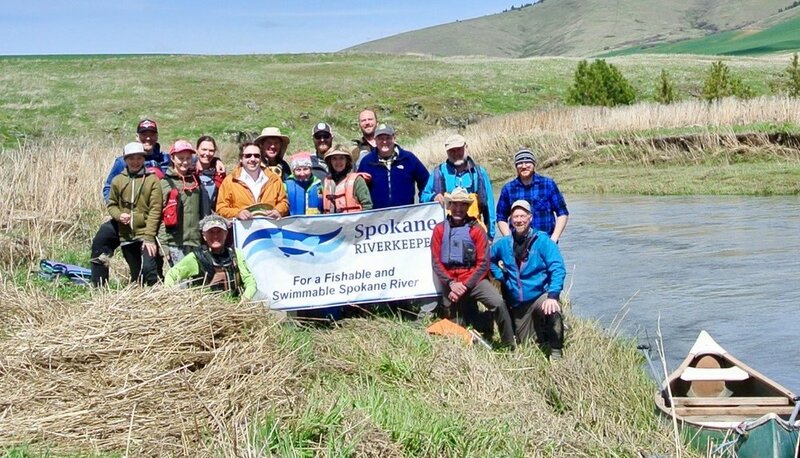 We launched near Tekoa, floated to Latah, and this is our story. We’ve all heard about the rather drastic water quality of Hangman Creek, but this story is not about that. 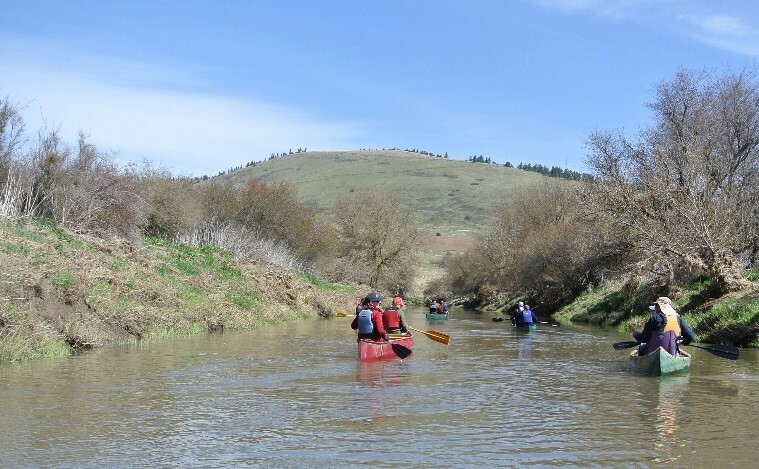 This story is about a day on a gorgeous stretch of water with friends, and about learning to love this creek, which is a major tributary to the Spokane River. We shoved off. Some were a little wobbly at first, but after some practice, we all got into the groove. Most impressive were the two teenagers along. I noticed one of the teens was really digging in with her paddle and seemed to be really enjoying herself – so I showed her a few new strokes: draws, bow-rudders, sweeps, and the like. In no time she was enthusiastically steering, which on a windy creek like Hangman, is a huge asset. I can’t wait to paddle with her again soon! There’s was a lot to see and learn along Hangman Creek. Many of us were amazed at how pretty the scenery was (although the water was chocolate brown). A couple of folks along identified many of the trees and shrubs along the way: red osier dogwood, coyote willow, boxelder maple, cottonwood, and in the distance blooming wildflowers in the natural areas. A surprising number of areas had a grassy area and/or multi-layered native vegetation for some distance from the water – which we were very happy to see. Other areas appeared to have been farmed right up to the water’s edge. We saw areas where high water had eroded the banks, and areas where the invasive reed canary grass was the only plant on the banks. We saw lots of wildlife! A family of otters delighted us with their playfulness and loud crunching sounds – we think they were breakfasting on crayfish. We surprised several owls, many raptors, mergansers, and great blue herons along the way. Part of this route lies along the John Wayne trail – and we could see the abandoned railroad grade in some areas. There were grain silos, fertilizer and trucking companies, abandoned farm machinery, and this most interesting old building along the way. Most of us were amazed at how much we enjoyed the scenery and being on the water. Even with water quality problems, upper Hangman Creek is beautiful, fascinating, and very much worthy of exploration and protection. We all learned a lot by spending the day on Hangman Creek. If you’re interested in seeing this area for yourself, let us know. We’ll give you some tips about where to launch, and where to take out. If you go, let us know what you see!